My passenger seat will not recline and is stuck all the way forward, i did some research on the and tried the instructions that was on document #PIC5579A by the seat back and forth in hopes of it solving the issue but that didn't work. 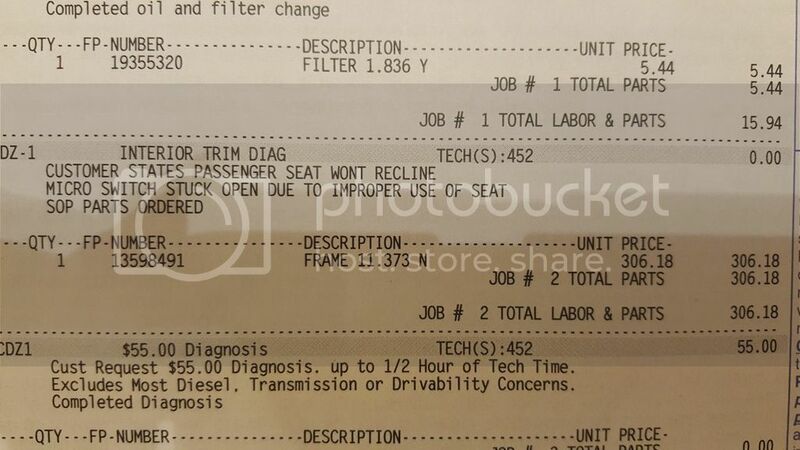 I took it to the dealership and they diagnosed it as micro switch stuck open due to improper use of the seat and in order to fix it i have to replace the entire seat back frame which is $300(parts) + $200(labor) which sounds INSANE to me just because of a bad switch which is probably $20. The dealership is saying the switch is "built into" the frame so you have to get the entire piece. Has anybody else ran into a similar seat repair problem. Thanks! What the hell is improper use of seat? You riding around with fat chicks? Lucky enough I'm the only person that drives mine and its set for me (and hasn't moved in 3 years)..
On a side note, if you want to try and fix it yourself try unplugging the seat (underneath) the motors have built in electronic fuses. once tripped and as long as they have ground they wont reset, unplugging them sometimes 'resets' the motors. 'Improper use of seat' sounds like the dealer trying to get out of any responsibility. Then again, no warranty at this point anyhow. That's weird. lmfao!!! well apparently i think from my understanding is you're not suppose to recline the seat all the way forward and then use the release on the back?? idk thats what really upsets me is that i RARELY use my passenger seat and there is some sort of "improper" use of it that can cost me $500....just unbelievable. well go to gm parts direct if checking the fuses etc do not work...often the harnesses can get messed with being they are just there under the seat.